So you're the first person in town to adopt an electric vehicle (EV), even clearing room for that 240v charging station in the garage. But what do you when you venture far from home, edging past the 200 mile mark on your Tesla Roadster? Well, if the Sanya Skypump ever sees the light of day (from its 150-watt solar panel), the hybrid solar / wind turbine-powered charging station will be making its way to parking lots around the world, pairing with a GE WattStation to juice up your EV as you shop at the mall, or browse a certain tech site from the office. The WattStation can theoretically recharge your EV in four to eight hours, though we're not sure how those figures translate with this particular setup. 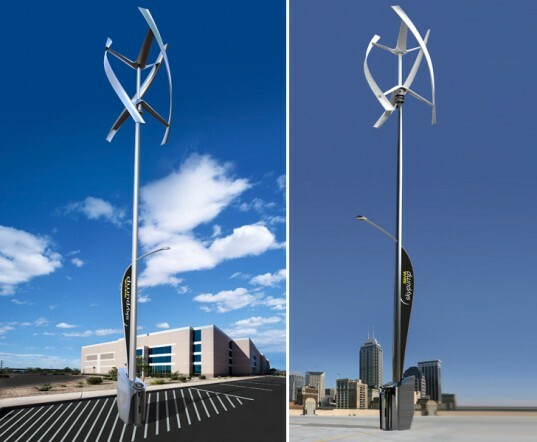 The Skypump system is based on Sanya's Streetlamp, which you can see in all its twirling glory in the B.o.B. music video remix just past the break. Sanya Skypump charges your EV, illuminates parking lots using wind and rays (video) originally appeared on Engadget on Sun, 24 Jul 2011 19:24:00 EDT. Please see our terms for use of feeds.